Now that the multiplexes are inundated with superhero movies, some are bound to be mediocre — and this cinematic adaptation of the DC comic is not great or even good. Orphaned 14 year-old Billy Batson (Asher Angel) is always searching for the single mother from whom he was separated at a Philadelphia Winter Carnival. Billy has a pure-ish heart which, seemingly, qualifies him to inherit the powers of the Wizard Shazam (Djimon Hounsou), who protects the world from the Seven Deadly Sins. Utilizing the iconic archetype of a childhood dream — aka saying a magic word and suddenly transforming into a superhero — Billy becomes a costumed, caped, muscle-bound man (Zachary Levi). Billy’s newfound power arouses the envy of evil Dr. Thaddeus Sivana (Mark Strong), who was always disparaged by his dad (John Glover) and subsequently rejected by the Wizard. Meanwhile, lonely Billy is remanded to new, compassionate foster parents (Marta Milans, Cooper Andrews). At their home, he’s befriended by disabled Freddy (Jack Dylan Grazer), who’s eager to help Billy test his extraordinary abilities, keeping them secret from his other foster siblings (Grace Fulton, Ian Chen, Jovand Armand, and little, scene-stealing Faithe Herman). 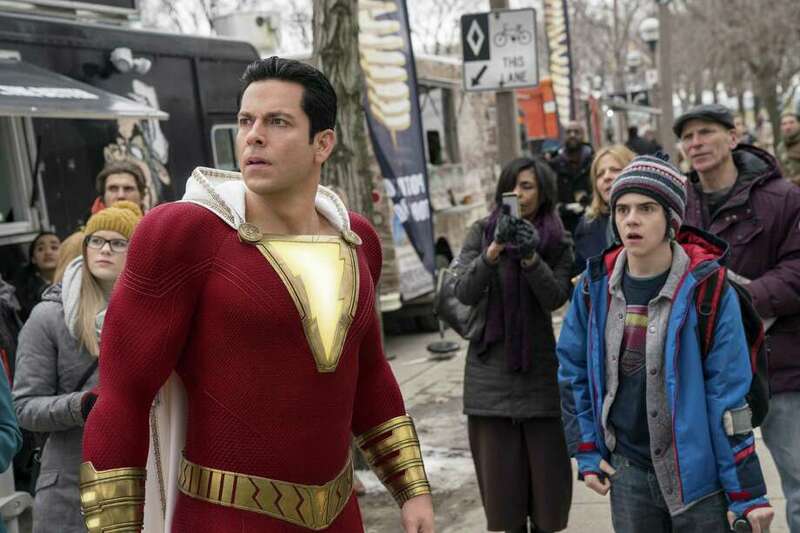 Problem is: in Billy’s basic “identity” story, screenwriter Henry Gayden and director David F. Sandberg never bothered to coordinate movements and gestures that young Billy might share with his older counterpart, so the two actors — Asher Angel and Zachary Levi — don’t seem to be playing the same character. And the storyboarding sometimes gets confusing, particularly the conclusion when all the foster kids are suddenly replaced by adults whom we’ve never seen before and probably won’t in the near future. FYI: While Marvel Comics has trademarked the name of Captain Marvel, casting Bre Larson as the newest Avenger, DC’s original Captain Marvel, dressed in a costume featuring a yellow lightning bolt, dates back to 1939 Whiz Comics and was modeled after actor Fred MacMurray. On the Granger Movie Gauge of 1 to 10, “Shazam!” is a silly 6, an irreverent, ebullient escapade. Susan Granger has been an on-air television and radio commentator and entertainment critic for more than 25 years. Raised in Hollywood, Granger appeared as a child actress in movies with Abbott & Costello, Red Skelton, Lucille Ball, and Lassie. She currently resides in Westport.